For the new version click here. Since it is impossible to move followers from blog to blog, I invite those who want that to join the "new" blog. It always takes me a while to get used to something, but once I get used to it, I hate it when people feel the need to change it. A good example of this frame of mind is the logo of the Intermarché, a supermarket chain, which operates throughout France. The shops are simply called Intermarché, but the chain has some form of surname as well, “Les Mousquetaires”. Why they chose this name is beyond me, although it is quite well possible that they are piggy-backing on the popularity of Dumas’s novel “The Three musqueteers”. Whenever we approached one of their shops, we could not get around looking at their logo, which was prominently displayed on the shop facade. Anyway, it shows how observant some clients are when it comes to “reading” adverts. However, after a number of years I got used to the logo, and what is more, I got somehow attached to it as well! One can imagine my surprise when I found out that Intermarché was undoubtedly advised by its marketing specialists that they should modernise. And of course, my beloved logo was the first victim. It is in the mean time replaced by a symbolic musqueteer. And even though it still says clearly “Les Mousquetaires”, there is now only one brave lad. Do I like the new logo? Or don’t I? Well, I think in another years time I will get used to it. But I must honestly admit, that without knowing the old logo, I would never have recognised a musqueteer in the new one! It was again monsieur P. who managed to turn a normally rather boring ceremony into something slightly more exciting. 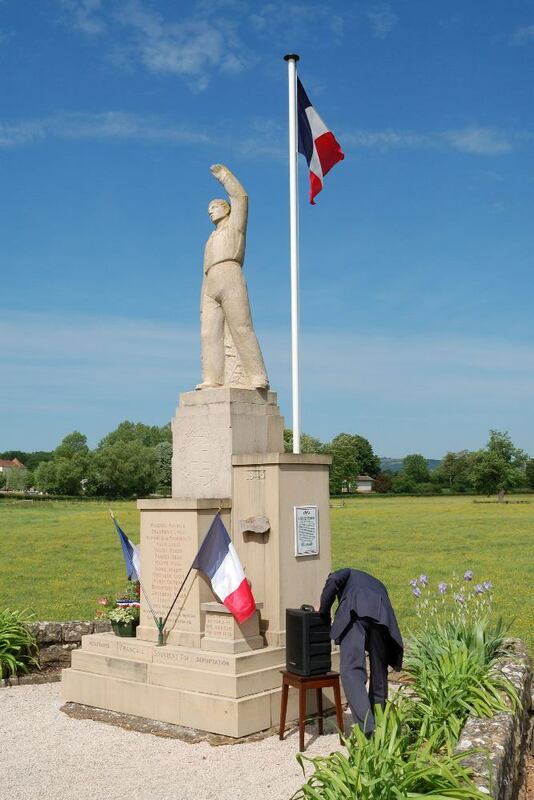 This time it happened on Liberation day, the 8th of May. Although there were more people attending than a week ago, the amount of attendants was still a bit disappointing. Fortunately the Sappeurs Pompiers turned up in great number, thus making the parade look more like a parade than just 10 people strolling along the main street. At the monument in front of the church monsieur P. took a little stool out of his car, followed by the modern amplifier with built in CD player. After the minute silence (French minutes, I have noticed, last not more than 35 seconds) and the speech monsieur P. squatted behind the amp and started to fiddle around with the knobs. After two international minutes from 60 seconds each the crowd started to get a bit restless. No trace of the French national anthem yet. Monsieur P. appeared red-headed from behind his devilish machine and asked the flag bearer, monsieur N. for advice. Finally, after a good 4 long minutes, the Marseillaise sounded across the church square. Next the parade, this time motorised, moved off towards Bois Dernier. Now monsieur P. did not take any risk. 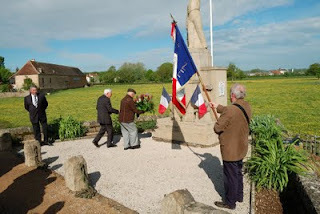 After he had installed the amplifier, het took over the flag from monsieur N., who, like an experienced DJ managed to elicit the Chant des Partisans and the Marseillaise from the CD player. With a sigh of relief the meeting broke up, and everyone, light at heart and glad about this happy ending went to Les Blés d’Or for a bite, and more important, for a drink…. The fact that the French are very keen on plays on words is something that does not stop to amuse me. Sometimes they come up with something more or less clever, like “Aux Berges de la Grosne” (On the borders of the river Grosne) which is pronounced identically to “Auberge de la Grosne” (Inn on the Grosne), for a restaurant that closed its doors last year, close to that little stream. It is getting worse the moment the French get the urge to abuse the English language (not the way I do, as a non-native speaker, but to be witty). Last year a supermarket was opened in Tournus bearing the name of “Simply”. What better slogan could they come up with but the meaningless and grammatically incorrect “Be simply, be happy”? Some other organisation organises an open air festival centred around mainly children’s games, which is called “On the road a game”. This jewel was clearly based on the hit by Canned Heat (1968) “On the road again”. The best one in this genre is undoubtedly "!What the folk? ", the name of a band around here that specialises in folk music; also note the use of punctuation marks! I do not think this one needs any further explanation. If there would be a contest for the maximum “jokes” one can embed in an advertisement, I might know who could well be the winner. “Le Papillon”, a beer bar and tea room in Bissey-sur-Fley, is moving from there and will re-open soon in the former “Aux Berges de la Grosne”. Not only did they change the spelling into “Le Pap Y llon”, where the Y could be used to impersonate a frothy glass of beer, but they did more, as the sign shows. Where the word “Bièrexquise” comes from, I do not know (maybe from “Exquisite beer”? ), but “convivialithé” is undoubtedly linked to the conviviality that is inherent in drinking tea. This one is almost better than the "Spéciali-thés" on the old sign! I am waiting for the owner to come up with something like “Our beer is bièrey, bièrey good!”. 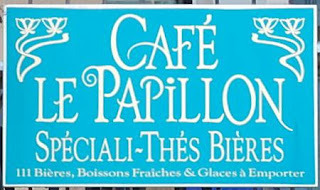 By the way: after having written this blog I found out that the owners of “Le Papyllon” were not French at all, but German! I declare the season opened! With the closing of the hunting season, the season of the wreath layings is now officially opened. My last blog on this subject goes back to July 2010, hence it is time for an update. 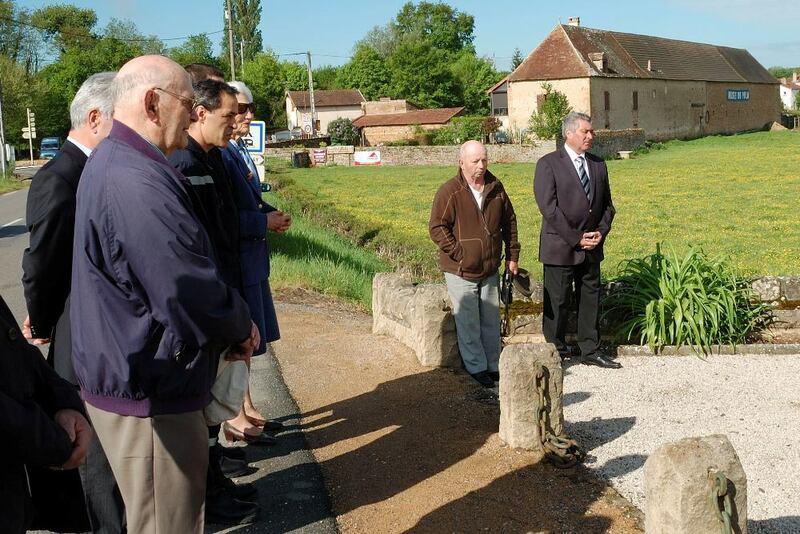 The last Sunday in April is France’s official day to remember the deportees of the Second World War. That coincided this year with Easter Sunday, possibly the reason why, despite it being a lovely sunny day, there were not many people present. Or contrary, was it due to the blue sky and high temperatures? Whatever the reason, at 9h55, only 10 minutes later than planned, a small cortege of cars drove direction monument in Bois Dernier. It is every time a surprise what goes wrong this time, hence I was watching everything with more than the usual attention. Which amplifier was going to be used to play among others the French National anthem? Monsieur’s P. old car was parked close to the monument, and there was no amp in sight. Was this a new attempt to force those present to sing the Marseillaise live? The wreath was laid by Monsieur P., a survival of Buchenwald, assisted by L., whose parents were deported and never came back. 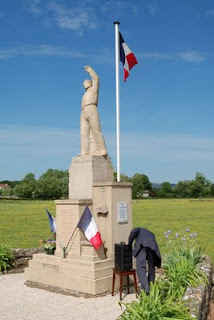 After the obligatory speech, dictated by Paris, Monsieur P. walked towards the hedge that lines the monument, pressed a button of the machine hidden in the hedge, and as if it had never been away it produced the crackling version of the Marseillaise I gotten quite fond of. 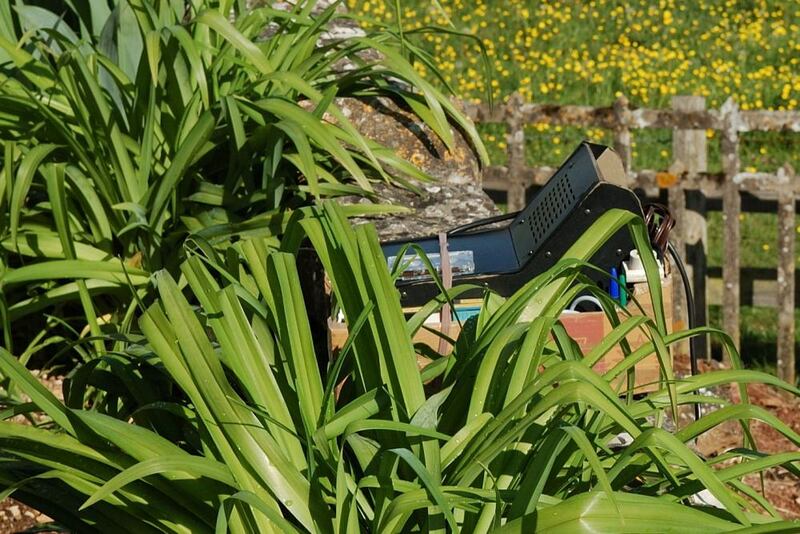 In the past I have been using a mock picture of this machine (actually a picture of one of my old transistor radios with built in cassette deck, positioned on the hat shelf of my car), but this time I managed to take a picture of the genuine product, hidden in the bushes. I used my camera whilst Monsieur P. read the speech from Paris. After which everybody went back to Cormatin, to Café de la Poste for a verre d’amitié. 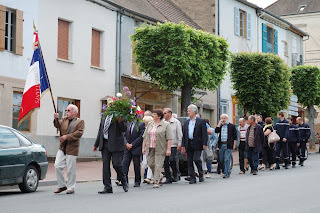 And because there were so few people, and the wine was ordered well before hand, most of the wreath layers staggered home, not quite sober one and a half hour later …. In earlier postings I have tried to pay some attention to the jazz life in this part of France; see the postings about the Crescent Jazzclub in Mâcon and Jazz à Trivy. The last series (usually 5 concerts per season) can boast concerts by international jazz artists, such as quite recently by organ grinder Rhoda Scott. Cluny itself hosts the yearly festival Jazz Campus en Clunysois. Having said this, I must admit that I never have been to one concert in the series. That is partially due to the fact that I am not well into the French jazz scene, and partially because I am not really interested in the work shops that are part of the festival. The same thing holds for another festival around here, Jazz à Couches. The program shows quite a big number of big band concerts, and one can ask oneself whether it is still possible to maintain a good quality big band. The past has proven, in better jazz climates than nowadays’, that maintaining a good big band was only just possible for great band leaders like Basie and Ellington. Another drawback for me is that, although Couches is in Saône-et-Loire, it is not exactly next door for me. Jazz et CaeteraJazz et Caetera is another organiser of good jazz concerts. Unfortunately Jazz et Caetera does not have a live website (anymore), but the paper as well as electronic newsletter luckily still works. Jazz et Caetera started off giving concerts in Château de Dravert in La Guiche, but the last few years they organise concerts throughout the region. In Châteu de Dravert I have seen an excellent concert by René Urtreger, the piano player who performed with Miles Davis during the recording of the sound track of “Ascensceur pour l’échafaud”. Michel Hausser, a well known vibraphone player in France, recently gave a concert in Château de Dravert, and Cluny as well as Messeugne hosted concerts by Austrian boogie woogie piano player Martin Pyrker. Of course it is impossible to maintain that boogie woogie is still one of the leading jazz styles. Having said that, however, what has preference: enjoying an evening out in a nice ambience, listening to good quality “old style” music, or sitting in one’s living room, listening to a CD with more cotemporary jazz music? Professionally, but also leisurely, we are very interested in things happening around here which might be of interest for tourists, and hence for our guests, such as concerts, markets, castles, etc. Not only do we do research for our own tourist web pages, but we keep an eye out for similar information on other sites, not to copy, but to investigate to see whether we can use it for our own site. One of our competitors, who is running a gîte not so far from here, mentioned on her website a cattle market in Charolles, which is a stone throw away from the weekly big cattle market in Saint-Christophe. 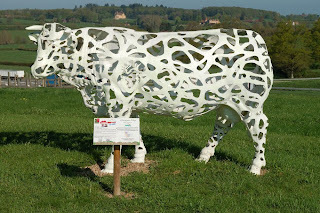 I quote: “In the cattle markets of Charolles and St Christopher-en-Brionnais you can admire the Charolais, the best beef cattle in France”. We know the Saint-Christophe market very well, but the Charolles market was unknown to us. So one sunny day we set off to explore this market, which, according to Mr. Google himself, was held every second Wednesday of the month, from January to May. I quote Mr. Google’s result: ”Le marché aux bovins a lieu le 2e mercredi de chaque mois (transactions à 9h) de janvier à mai au Parc des expositions”. When we arrived there, there was not a car in sight, there were no farmers, no cattle, let alone a market. 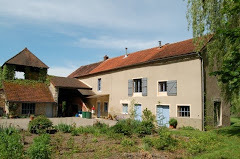 When we inquired opposite the market hall, at the Maison de Charolais, we found out that there had not been a cattle market for years, because all cattle transactions were nowadays concentrated in Saint-Christophe. 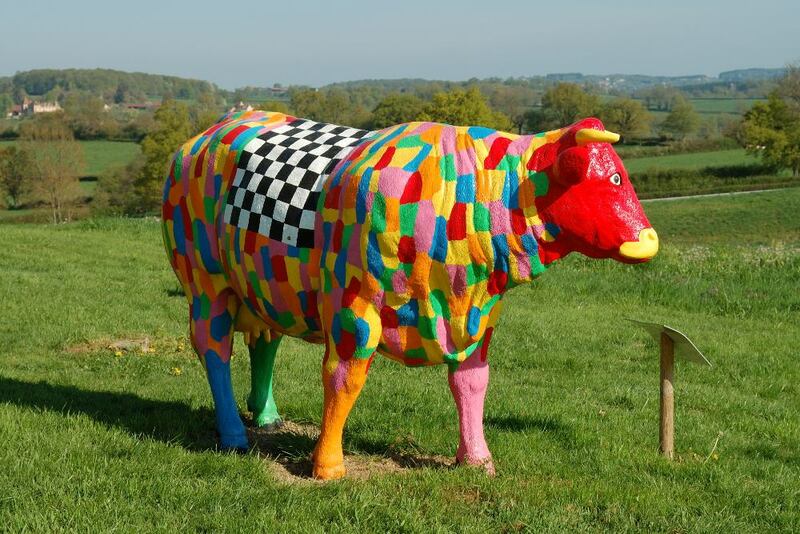 Wondering outside I suddenly realised what could have been the reason for stopping the market; there was a whole bunch of stark raving mad cows grazing around the Maison de Charolais. And who wants to trade cows with those animals around? Based on my professional background the phrase “Lessons learned” springs to mind. Lesson learned from this day: never trust information given by your competitor! 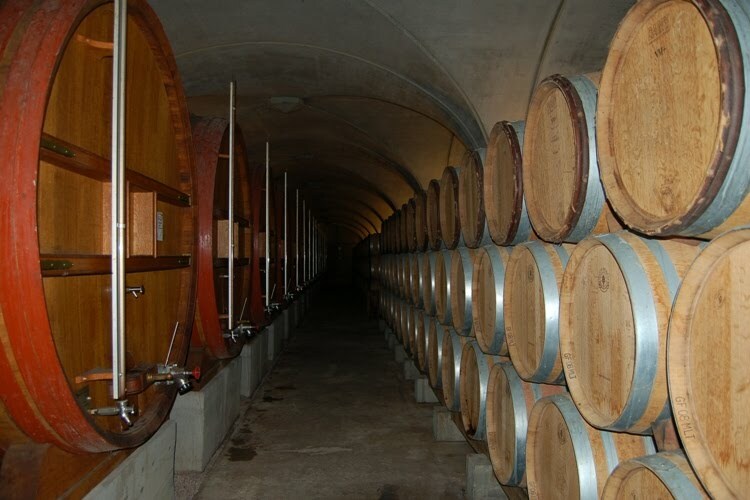 One of the main sources of income in Burgundy is undoubtedly the income from the numerous vineyards and caves in the area. Often we get questions concerning wines from our guests, and although we know next to nothing on the subject, we always try to advise them as best as we can. Luckily often these people know even less about wines than we do, and that makes us kings in the land of the blind. From experience we know, that good white Burgundy wines are easy to get hold of, at reasonable prizes. Any cave around here, Viré, Lugny, Chardonnay, Bray, etc. 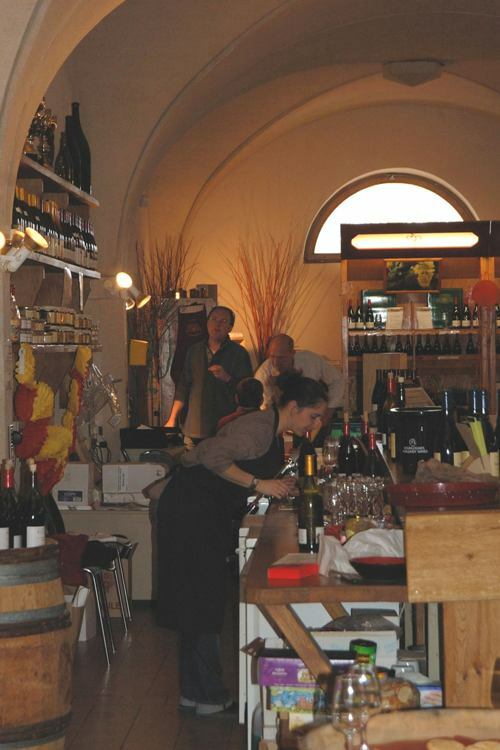 sells good white wines and offers tastings. Red wines are a bit more difficult. If one does not want to spend a fortune on renowned reds from e.g. the Beaune area the choice is less simple. We find the red Mâconnais from around here very often weak, not to say a bit watery in taste, reason why we normally do not buy red Mâconnais. Having said that, the proprietor of the nearby Domaine de la Combe de Bray, Monsieur Henri Lafarge, sells a very nice full bodied red for around € 8.00. His cave lies a stone throw away from our house, in the village of Bray. One of the disadvantages of caves like this is that they normally only sell their own produce, and hence the choice is rather restricted. 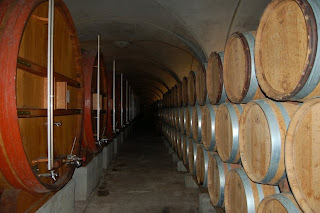 Those who prefer to have more choice we generally refer to the Cave in Martailly-sous-Brancion, which has a very wide range of not only Mâconnais, but also of wines from the Côte d’Or. And then there are always those who prefer to go to a cave armed with a jerry can whilst saying to the attendant “fill her up, please!”. For these customers the Cave Cooperative in Saint-Gengoux-le-National (a branch of the cave in Buxy) is ideal. For a good vin de table, the non-headache variety, put in the jerry can by means of a petrol pump, one pays between 1 and 2 euros a litre. The wines from the pump however do not come from the region. 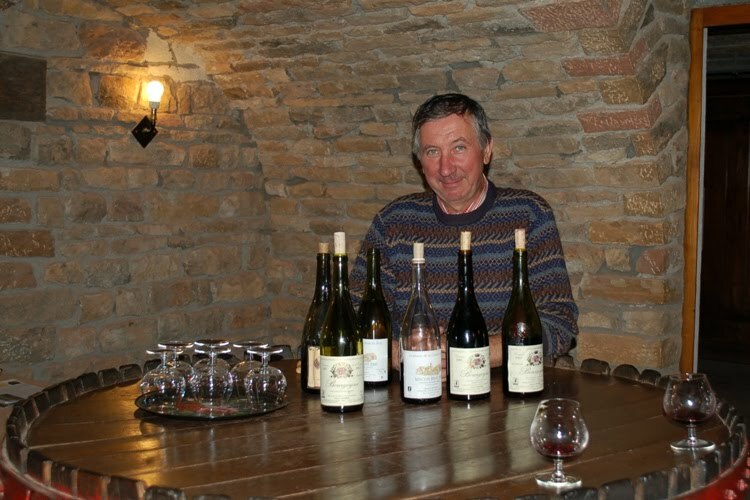 The Burgundian wine growers can earn a lot more by producing their AOC wines. The pump wines come from other parts of France, where the production is so high that they happily “export” their surplus at cheap rates to Burgundy! The Cave Cooperative (most of the time, but not always, the cave in Buxy) organises special dégustations. 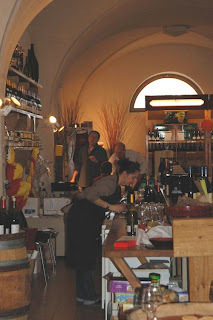 There one of the (very knowledgeable) employees will present a number of wines that go very well with a specific dish. The last time we were there, the food samples and accompanying wines followed the pattern of a standard French meal, i.e. starter, meat dish, fish dish, cheese and sweet dessert. The woman who did the presentation (in our case that was Nadia from Saint-Gengoux), gave an excellent rundown on dishes as well as wines. There was non of this snobbish behaviour, so typical for a lot of the wine evenings organised by so-called connaisseurs! Wherever you drive round around here, you are bound to bump into signs towards parking areas, either for the Voie Verte, or for the Balades Vertes. The first ones are normally located at or nearby the road that runs parallel and next to the old railroad (e.g. the D981), the latter ones one also finds in villages a bit further away from the main road. 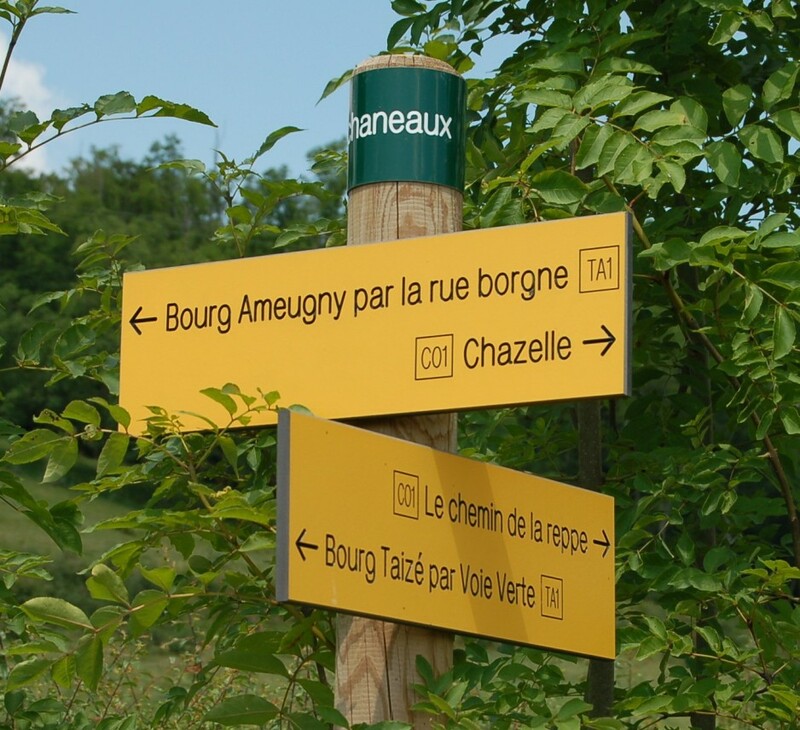 The Balades Vertes form a network of walks, laid out in the countryside, and signposted with either small yellow signs or the standard (yellow) arrows and crosses the French walker’s association employs. There are books available with a description of all the walks of a certain area, but A4- descriptions of the single walks are also for sale, both at the local Tourist Offices. These walks are very attractive. 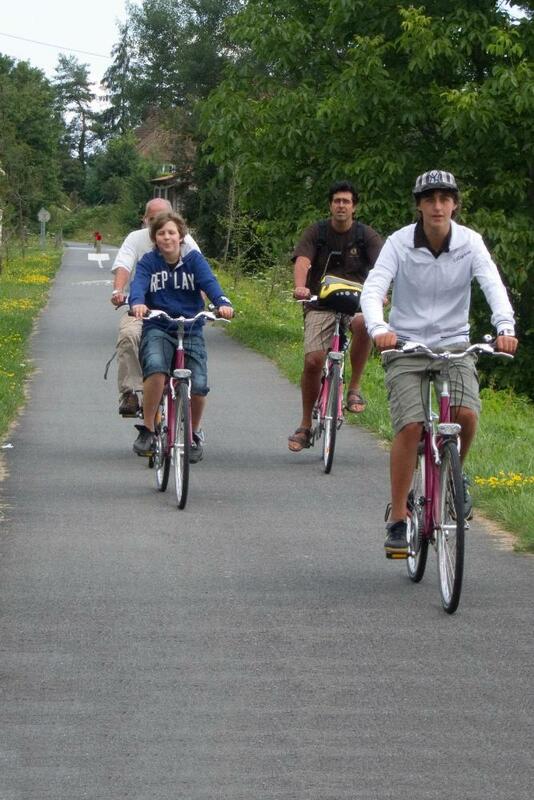 Not only do they go through many picturesque villages, but most of them follow paths through woods and vineyards. The winter time menus in the many restaurants around here often have game on it. It may be clear, that game is not only to be admired in restaurants; deer are not uncommon here, and wild boar is also roaming the forests. La Tuilerie is again located on several Balades Vertes. One of the two walks starting in Cormatin almost passes along our gate, and the second one goes through Chazelle. As said earlier, the walks are marked, and each walk also has its own number. De walks that start in Cormatin are marked CO1 and CO2, those from Taizé TA1, TA2, etc. The project itself, and the maintenance of it, are partially paid from the revenues of the taxe de séjour, a tourist tax for each of our guests which we have to pay at the end of the season. Not only do our guests (indirectly) pay for the Ballades Vertes, they also profit from it directly! This blog in 3 episodes is of course far from complete. For more information about this region I like to refer to the tourist page on our own website and to an extensive blog about tourism and activities around here. The first boucle I did was no. 10, with difficulty 1 (made for me! ), distance 15 km and estimated time 1h30. The route comes almost past our house, and hence I joined the route at the end of our path. 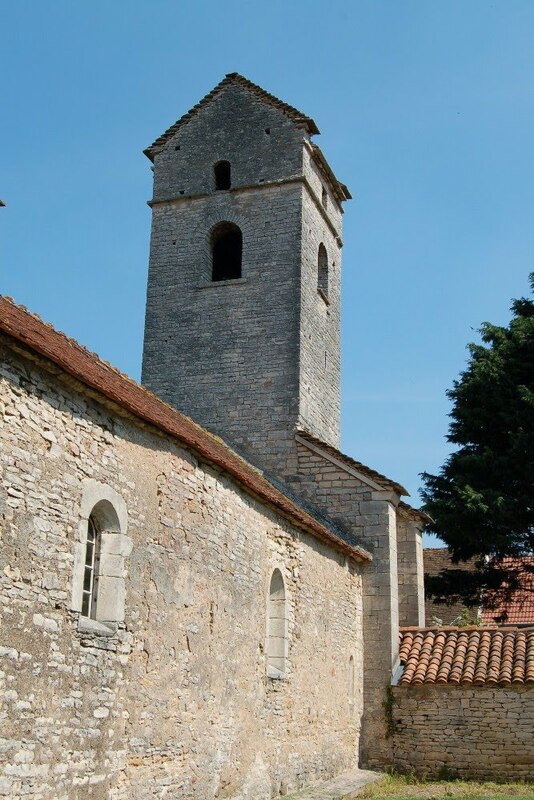 As the name of the boucle indicated, this circuit passes by some nice Romanesque churches, like the very small church of Lys (with remains of some medieval wall paintings), and the beautiful church of Chapaize. Lys also boasts an amazing amount of artisans, and Chapaize has facilities to sit on a terrace with a drink, or to stop for a meal. From Chapaize the road goes via Bissy-sous-Uxelles through Bessuge to Cormatin. And also Cormatin has ample opportunities to drink a cold glass of bear or enjoy a meal. Indeed, if you feast your eyes on the things you can see underway, you will be back at la Tuilerie roughly one and a half hour later. Another plus point of these boucles is, that they are fairly well signposted, and that it is possible to link some boucles together to create a bigger circuit. As boucle no. 10, some boucles are thematic. Boucle no. 11 for example takes you past a number of lavoirs or public washhouses. These are small open, covered structures, with a stone basin in the middle, where until the seventies the village women were doing their washing. The basin was provided with fresh streaming water by a nearby river or a brook. No. 11, difficulty 2, length 17 miles can be perfectly combined with e.g. no. 10. The route starts in La Tuilerie, and passes through Lys, Bissy-sous-Uxelles, Bessuge, and Cormatin. It continues via the Voie Verte to Savigny-sur-Grosne, carries on via Boucle 11 to Bonnay, Cortevaix, Flagy and Massilly where it joins the Voie Verte, which takes you underneath Taizé direction Cormatin until the road to Chazelle. Other thematic boucles bring you past potters, through vineyards, etc. 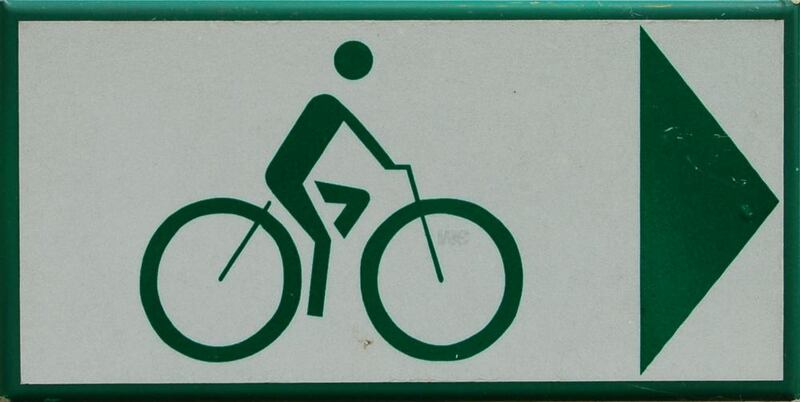 One of the frequently asked questions is whether it is safe to cycle along the roads. The answer is: yes. The boucles are generally following quiet roads and hardly “main” roads. Further, the French are sticking very well to their traffic rules. One of those rules is, that when overtaking an bicycle with a car, the driver has to leave a distance of 1 m (approx. 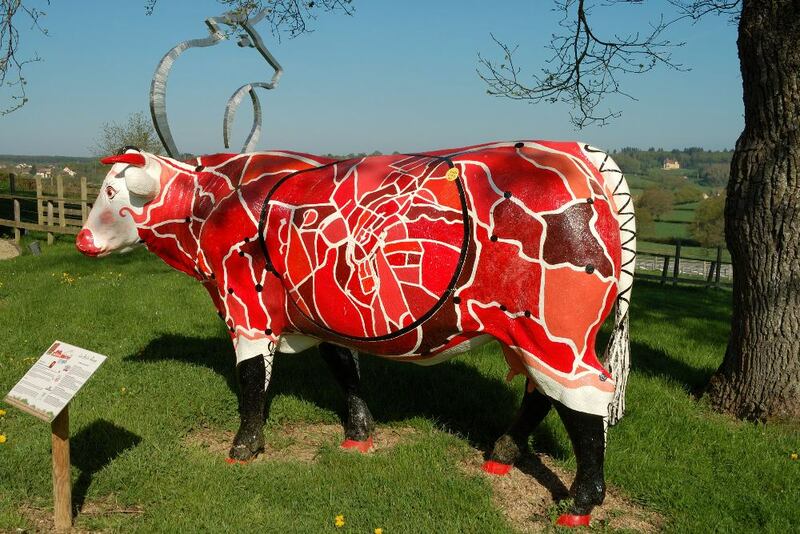 3’4”) in villages or 1.5 m (approx. 5’) outside villages between car and bicycle. 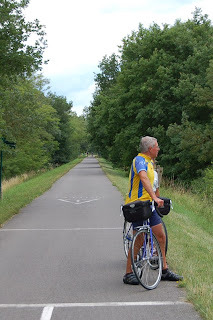 For more weathered cyclists there is also the possibility to test their stamina around here. Some of the boucles with difficulty 4 contain really vicious climbs; the real die-hards amongst our cycling guests have expressed their pleasant surprise about the possibilities to exercise their muscles. In my next and last blog in this series I will elaborate a bit on the concept of the Balades Vertes. Those familiar with this blog and this region should know by now that a cycling or walking holiday in Burgundy more has to offer then just wine and good food. For those not familiar with the area however, this blog might be an eye opener. For years I have cycled day in day out the 10 miles between house and work and vice versa. After having moved, in September 2005, to France, this daily routine was one of the things I missed most. Of course, certainly in the beginning, we were too busy getting the gîtes and the campsite up and running, organising the enormous amount of stuff we had brought over, etc. to have much exercise. During that time I cycled regularly into Cormatin, to buy bread and a newspaper, but 2 x 2 miles a day is not the same as 2 x 10 miles. To make up for the difference I cycled the 8 miles up and down to Cluny as often as was needed to buy a book or something else which was not readily available in Cormatin. Only after the big renovation was over, time came to concentrate on finding out what would people attract to this part of the world for a holiday. One way of finding out was to get on my bicycle and cycle into Cluny, where the Tourist Office not only has an excellent staff, but also a good collection of brochures. And because I had cycled through Taizé and Massilly along the Voie Verte, it seemed logical to pick up some information about this cycle path. I found out very quickly, that the Voie Verte more had to offer but just cycling along an old flat piece of converted railway (approx. 44 miles) between Givry and Charnay-lès-Mâcon. 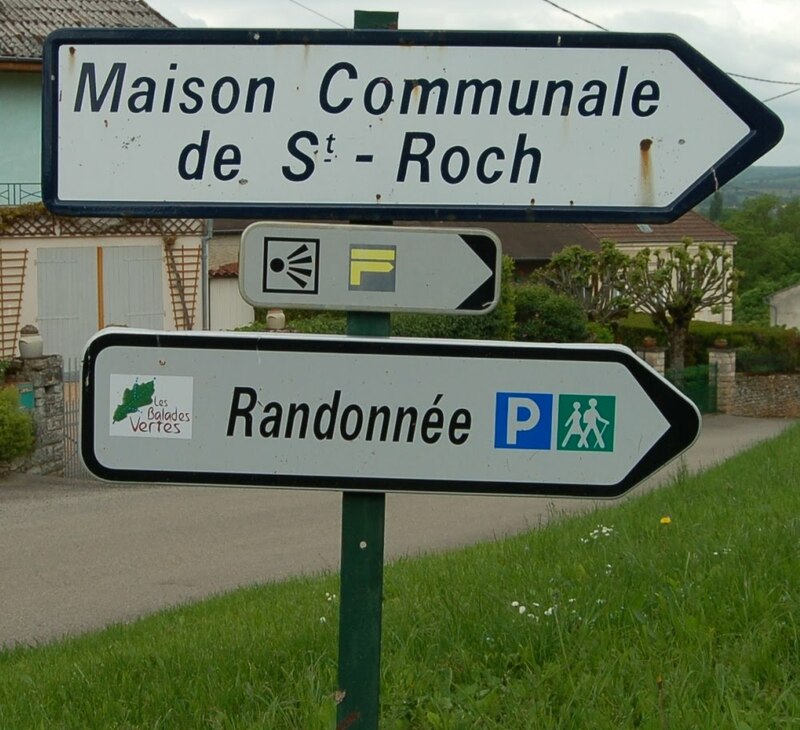 The tourist offices around here have free maps of the Voie Verte available, where one can see which round trips (boucles) there can be made from various spots along the Voie Verte. All these circuits are signposted with little shields along the roadside. Very soon I spotted near our house some of those signs. It appeared that the Romanesque (Norman) church route almost passed by La Tuilerie. All boucles start and end at the Voie Verte, normally by a parking area for those who want to leave their car somewhere and carry on by bicycle. Boucles 10 and 10bis start from the parking area at Cormatin-Bois Dernier, but of course one is free to start wherever one wants. All boucles have a degree of difficulty ranging from 1 (easy-peasy) to 4 (why on earth am I doing this??? ), a distance, an estimated time (sufficient time to visit the tourist attractions underway), and they all start where they end. About the various boucles I will write in my next blog. Anyway, I was well impressed by the scale of the event. 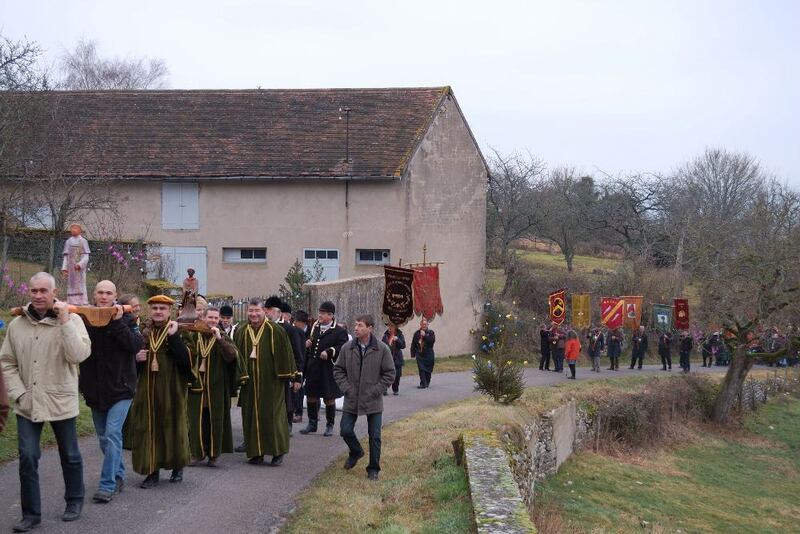 There were several hundreds of people in the procession, which started in Vaux, and climbed the short distance uphill to the church of Saint-Ythaire. The various Guilds had their banners and their different uniforms, whereby the “Chevaliers” of the “Confrérie” were not only carrying their Saint Vincent, but also other paraphernalia. 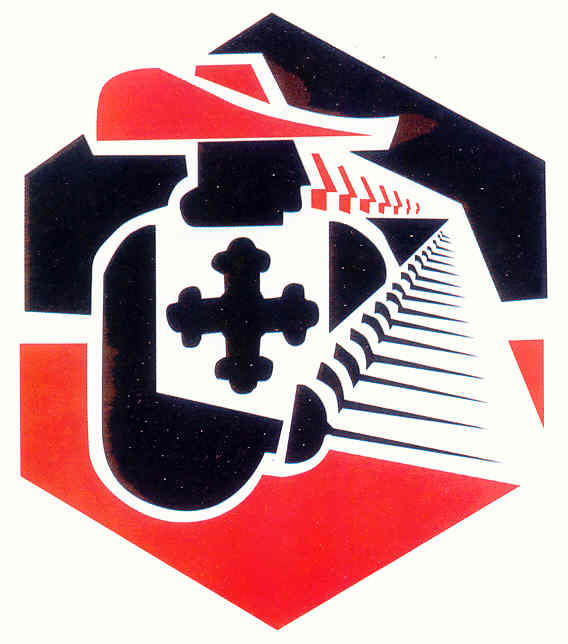 Their coat of arms depicts a cork screw and something resembling a hand grenade. Today we had a better look at this coat of arms and only now we found out that the holy hand grenade, on the other side of the holy corkscrew, was in reality a side view of a tastevin, a shallow metal, often silver platter which is constructed to display the colour of the (red) wine, and used by professional wine tasters. All members of the Confrérie were wearing a big tastevin around their neck, and one was carrying a huge corkscrew. The mass was celebrated in a normal French way. 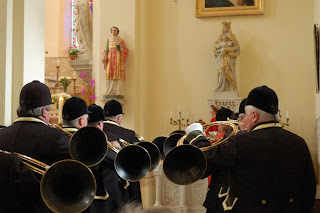 However, because the church was chocker block full, and we were seated in a recess, right behind a bunch of 10 (ten) horn blowers; I almost got a heart attack when completely unexpectedly all ten of them decided to join the congregation in a song. Then there was the inevitable wreath laying at the war memorial, followed by a vin d’honneur at the town hall. But what is a fête in France without a lunch? 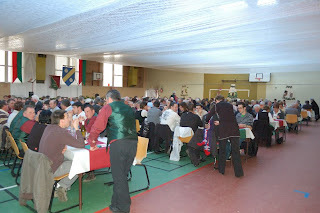 After two o’clock we piled into the Foyer Rural of Saint-Gengoux, where I did a quick count; the tables were laid for 200 people. We found out quickly who did the catering; a company from Montchanin (about 25 km away) had brought over food, professional cookers and cooking utensils and prepared a stunning meal for all present. At the end of the meal another ritual had to be performed. A few members of the communes involved were invited to join the Confrérie, and some were even appointed “Chevalier”; they were given the accolade by means of what we have dubbed the holy corkscrew. 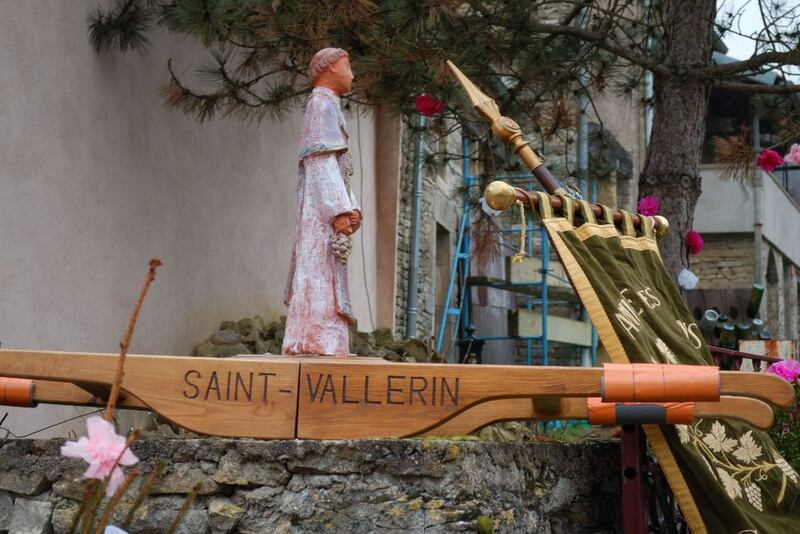 January 22 is the official day of Saint Vincent, the patron saint of the wine growers. 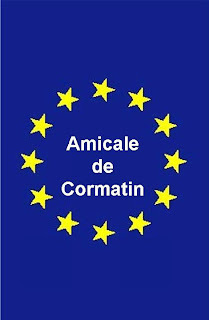 This is a festival that does not go unnoticed in this wine growing area, but having said that, because we live in a small almost wineless enclave, Cormatin itself is not really involved in this tradition. 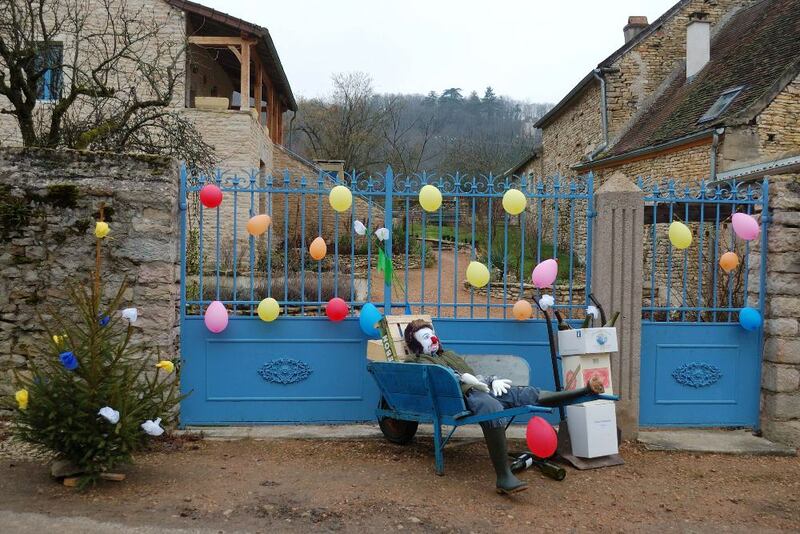 There is a yearly big festival for the whole of Burgundy, which is rotating yearly from village to village. The festival lost its importance at the end of the 19th century, parallel with secularisation of French society, but was revived in the late thirties, and last year 40000 people took part in the celebrations. In 2009 the Saint Vincent Tournante was held in the area of the Mâcon-villages appellation. 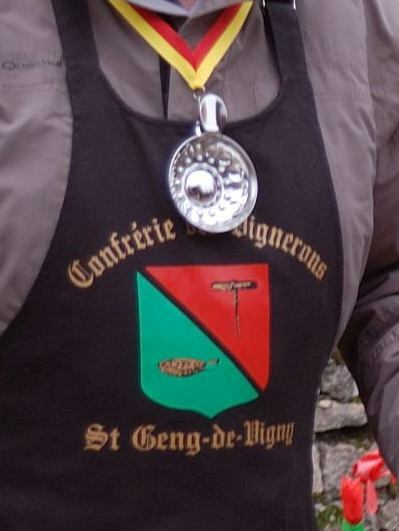 In places where there is still an active “Société de secours mutuelle” (something like a wine growers union, association or guild), in our part of the world united in a bigger society, the “Confrérie des Vignerons de St Geng de Vigny” (note the typical French subtle play on words - Saint-Gengoux or Saint-Jean and vigneron or vignoble), a yearly local St. Vincent festival is celebrated. This festival also rotates every year, although in a much smaller area. 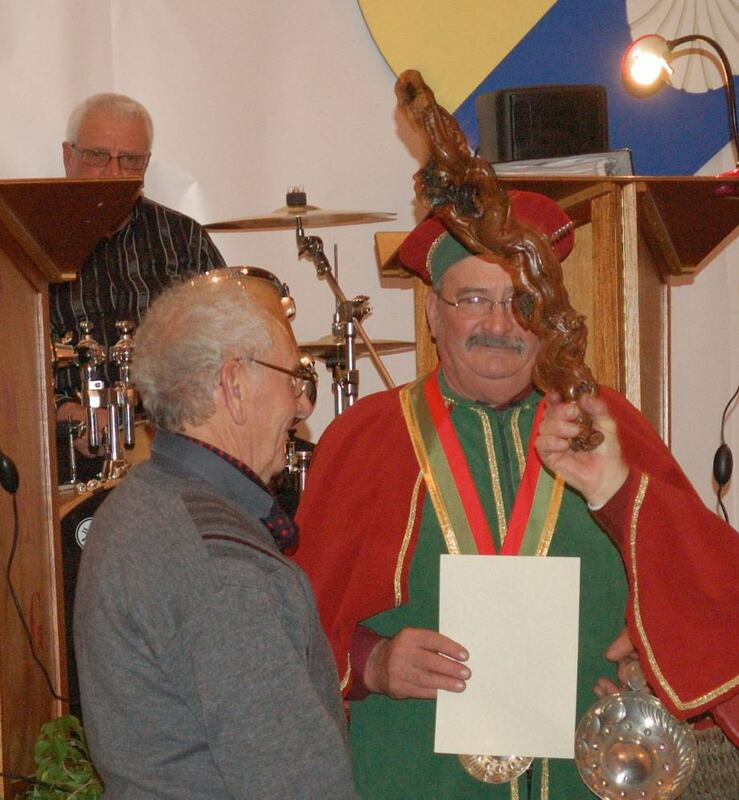 Although not directly involved, we had heard from friends who live and are active in the local Amicale or Foyer Rural in the nearby village of Saint-Ythaire, that the local Saint Vincent this year was hosted by their village. They have been busy for months, one evening a week together with other villagers, to fold paper flowers to decorate the village. 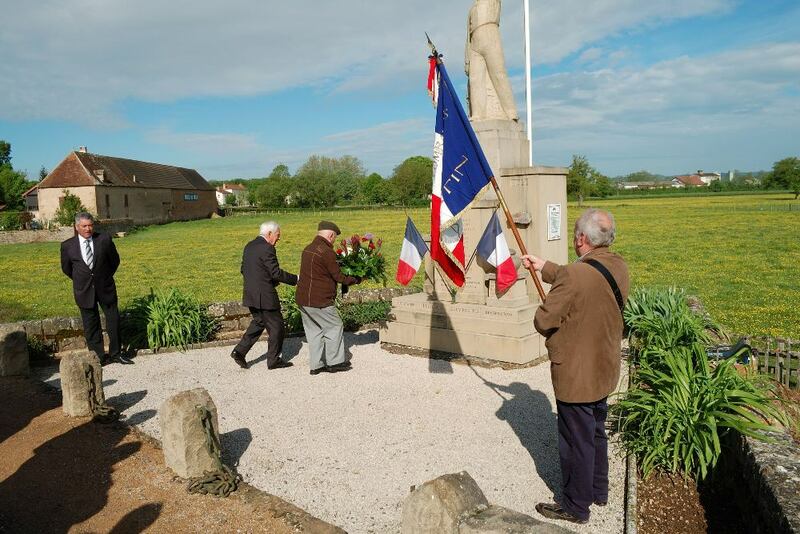 Since we are involved in similar projects in Cormatin, we realised how big this event must be in comparison to “our” one night flower folding event for the yearly Téléthon. Anyway, we expressed our interest in this festival, and our friends kept us up to date. Recently we were issued with a program and an inscription form, we paid our entrance fee, and bingo, we were in for a day out on Sunday 7 February. It turned out to be a misty day, when we turned up at 9h30 in Vaux, at a barn next to our friends’ house. 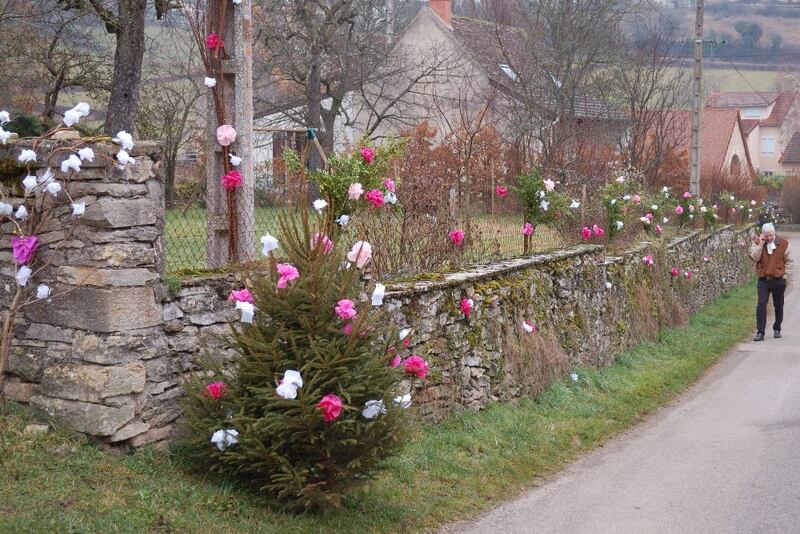 They had indeed done a wonderful job in decorating the village. 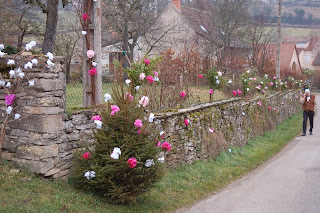 Not just in the village itself, but also along the roads leading up to Vaux and Saint-Ythaire there was an overabundance of Christmas trees along the streets, decorated with paper flowers. The trees were partially donated after Christmas, partially freshly stolen from the surrounding woods. Also hedges and permanent trees were “flowering” in a sea of yellow, red, green, violet and blue. Apart from that, displays were made of various materials, whereby the number of “puppets” draped in wheelbarrows, surrounded by numerous empty wine bottles, suggested more than seven drunken nights. Of course nobody turned up in time; this is France after all. But by 9h45 sort of a parade was formed, headed by the various Guilds in their uniforms with banners and their own statue of Saint Vincent. 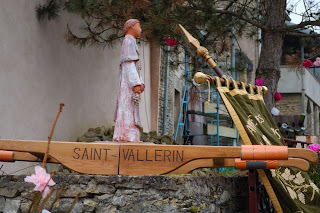 I dropped my proverbial clanger, when I saw Saint Vincent standing on a sedan chair, where the carrying structure clearly said “Saint-Vallerin”. I shouted out that these guys had brought the wrong Saint, not realising that it was the name of the village where this Saint Vincent lived, and not the name of the Saint itself. Yesterday it was finally the big day; we had to play loto or bingo for those living outside Cormatin who had bought a number of cards. 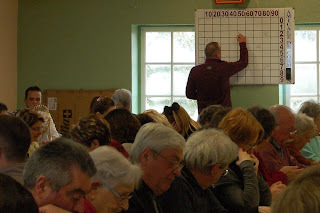 Around five in the afternoon the Salle Saint-Roch started to fill up with villagers who came to play bingo in loco parentis. Quite some cards had been sold, so every player was in charge of a generous amount of loto cards. We both played on 12 cards each; the cards had been distributed randomly, so in theory nobody was playing the cards he or she had sold. After half an hour the first prize (a flat screen TV) fell. The card had been sold by one of our council workers to his father in law. The game continued, and the next prize fell on a card that had been bought by someone from Cormatin. The card was checked by one of the officials, and yes, it contained all the correct numbers. The game was just about to continue, when somebody else rather sheepishly shouted “Bingo”. And this card turned out to be a winning card as well. When more then one card wins at the same time, each potential winner grabs a bingo ball from a bag; the highest number wins the prize, and the lowest number gets a consolation prize (often a small pot of paté from the supermarket). In this case the late comer had won. The winning card was confiscated by an official, and she looked in her paperwork which person had sold the card with no. 354 and to whom. The poor woman than had to announce the name: after several tries she came out with the name of a certain Pocahontas from Luxemburg, who had bought the card through Sue Nixon. 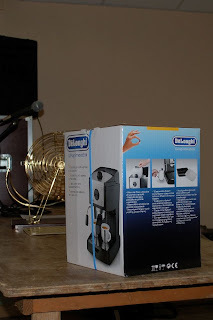 It quickly dawned on us that the winner was one of our last year’s campers, who follows this blog regularly. His Lithuanian surname starts wit P., and slightly resembles Pocahontas.... He contacted us immediately after he read my blog about the loto for the Amicale and forwarded money to buy some cards straight away. 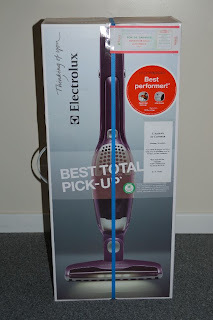 However, winner or not, I have to disappoint him a bit: he did not win the espresso machine which he wanted, but a brand new cordless hoover; no misunderstanding, this is NOT an old hoover whereby someone has cut off the cable! The other members of our network who have bought cards will receive an email from us telling them that they did NOT win. 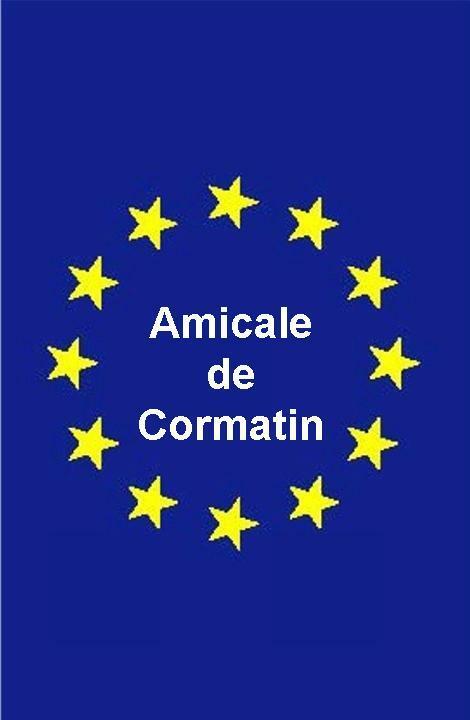 But we are 100 % convinced that everybody has bought cards for the good cause, and the Amicale de Cormatin will certainly see to it that the money is put to good use! Units of the world, unite! Somebody who follows my blog on Facebook commented on my previous blog about fire wood. He lives in another part of Bourgogne, in the Bresse region, and apparently the wood there is not delivered and measured in “stères”, but in “moules”. Ever since I started work in the petrochemical industry, and got involved in working in the imperial units of length, volume, weight, force etc. I have been fascinated by the variations in archaic units; the Netherlands knew in the past at least 6 (six!) different inches, ranging between 24 and 27 mm, depending on the region. It is interesting to know, that although the metric system was developed in France during the French Revolution, the first head of state to enforce the metric system by law (in 1820) was the Dutch King William I. This fascination caused me to open the French Wikipédia and look up what they have to say about moules and stères. 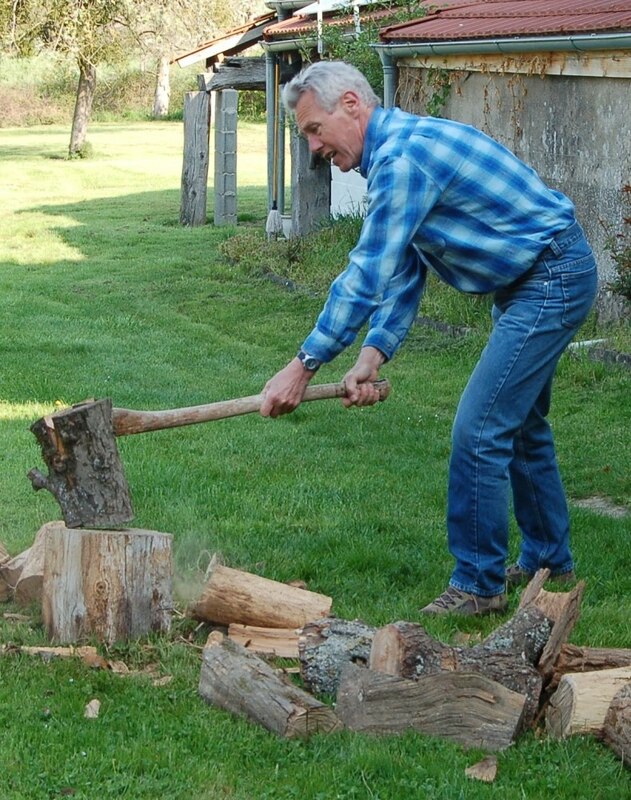 The moule is a unit of volume for cut wood, which goes back to pre-(French)revolutionary times. And as with most ancient units, this one is also regionally defined. In the Savoie a moule measures 1.6 stères, in the Chablais, a part of the Haut-Savoie it measures 3 stères, and in Burgundy it is as much wood as you can get into a cube with sides of 1.33 m.
This last dimension is no doubt an equivalent of 4 ½ French feet or a number of other local units. This boils down to a gross volume of 2.353 cubic metres. When 1 stère is equal to (effectively) 0.7 cubic metres, a moule should be 3.36 stères. However, my spokesman from the Bresse states that a moule equals 2.63 stères. A simple calculation makes 1 (Bresse) stère effectively 0.89 cubic metres. And that tallies with the rest of his story, wherein he tells that his wood is delivered in 1.3 metres lengths. One has to stack neatly, and hence economically, to stack 1.3 m lengths in a cube with sides of 1.33 m! People around here use the following expression when they talk about fire wood: it keeps you warm three times; the first time whilst chopping it, the second time whilst stacking it, and the third time whilst burning it. And although we only have been in the woods once to to chop up trees (and that was never to be repeated! 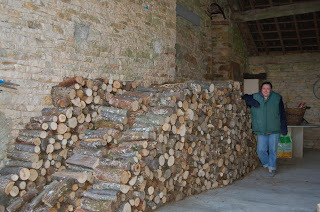 ), our fire wood manages to keep us warm three times as well. Quite some time ago now we have found a guy who delivers wood neatly chopped up in bits of 1’-2” long, and his stères are quite generous as well. 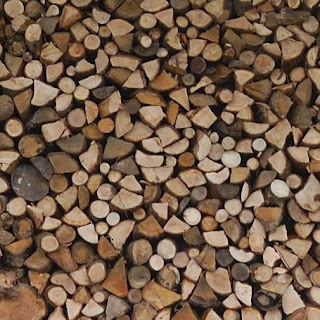 The disadvantage of his wood is, that it is rather wet, hence not ready for burning when you buy it. For those not familiar with continental units of measure I will explain what a stère is. A stère is the amount of wood you can store in a box of 1 m by 1 m x 1 m (a box with all 3 sides of 3’-4”). Since the quantity heavily depends on how one stacks the wood, the effective volume of wood in a stère can very widely. Think of a matchbox; the box can contain a lot more matchsticks before you drop it on the floor than after you have been trying to put them back into the box haphazardly. A stère varies effectively between 0.8 and 0.6 of a cubic meter. Also, one wood merchant can be quite different from another, as we have found out. Our first order, in 2005 was for 6 stère. On D-day a truck appeared, the man dumped what we thought looked like a respectable stack of wood, and we started stacking it. The wood was dry enough to be burnt straight away, which was a good thing, because we needed it there and then. Spring 2006 we took part in the affouage of Cormatin, and that was our first and last experience with cutting down trees in a forest. A year later we found a different and cheaper wood merchant; his wood however was rather wet, and had to be kept to dry for about another year. We then found out the difference between one merchant and another, and consequently between one stère and another. This guy also turned up in his truck, and dumped what looked roughly like the 6 stère of the year before. Since this time we had ordered 12 stère, we were expecting the man to return once. But no; he made it quite clear, that his truck contained “only” 4 stère, and hence that he would return twice. The stères of the first merchant were about 30 % smaller than those of the second! The disadvantage however is, that we always have two stacks of wood by the house. Normally the first 12 stère are dumped early in the year at the toilet block for the campsite. We stack the wood under the shed there, which is open on three sides. Hence the wind has got free play there, and the wood does not get rained on. After a year this wood is ready for “consumption”. At the end of the year another wood displacement takes place. The dry wood is then brought into the vide, a covered area between the house and the old kiln, and then re-stacked there. The advantage of having the wood here is that we do not have to plod through the snow in winter when we need wood, we just descend the staircase, fill a basket, and ascend again. And the next spring this whole cycle is repeated. How much work is involved in stacking 12 stères of wood? I started clearing the way for the guy, opening gates, getting garden furniture out of the way etc. from about 9h00 until I heard the truck approach. The man who brought the wood arrived at 9h40, and dumped the first load. We stacked for about between one and a half and two hours, and just when we wanted to sit down for a coffee, the guy turned up again at 12h00. After a quick lunch we stacked again until 14h00. At 14h15 the last load turned up, and at approx. 16h00 we were finally ready to sit down. Who would complain about a 6.5 hours working day? 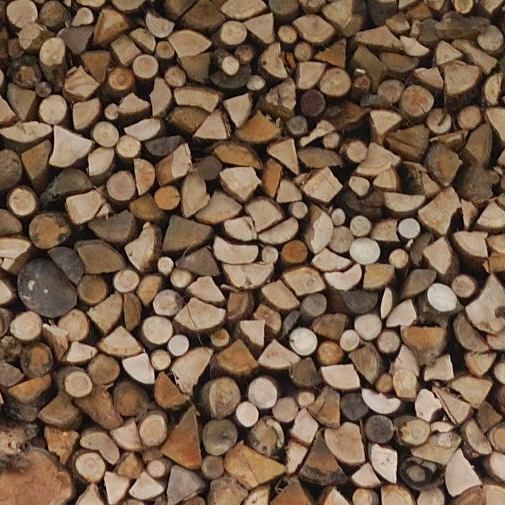 Anyway, our wood certainly keeps us warm 3 times: the first time whilst stacking it, the second while moving and re-stacking it, and the third time whilst burning it! 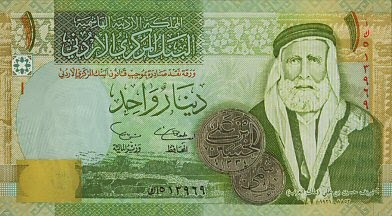 Sometime ago, in view of a holiday abroad we wanted to buy some Jordanian Dinars. So what does one do? One goes to the nearest centre of the universe, in our case Cluny, enters the Crédit Agricole and asks for a fistful of Dinars. “No sir, I am sorry, but we do not deal in that sort of money. Dollars, Pounds, no problem, but ….” Maybe the Post Office? No way! There was not much choice left; Mâcon should have what we were looking for. Here the refusals differed, from “No, Dinars are only sold in Jordan itself”, “We can only help you if you have an account with us” to “Why don’t you try a Bureau d’échange?”.We had half expected this, so we were prepared. Mâcon does not have any Bureaux d’échange, and Jordan Dinars are freely available, also outside Jordan. After a rather frustrating trip past Crédit Agricole, CIC, Paribas, Post Office, Banque de France and Crédit Municipale we finally ended up in the Tourist Information Office. The young lady behind the counter made one telephone call, and told us that the nearest possibility to lay our hands on such exotic currency would be the Banque de Paris in Lyon. Well, to drive 100 km to Lyon and back seemed to be a bit over the top, and hence we gave up. How we finally managed to get some Dinars after all? Elementary, my dear Watson! We were leaving for Jordan from one of the suburbs of London. And when you call Marks & Spencer one day beforehand, you can pick up your Jordan money the next day! I could not have guessed what impact my previous blog had. Literally seconds after I had confirmed publication of the blog, an email came in from a completely unexpected source. The mail was written by someone who stayed on our campsite last year, and who obviously follows my blog with interest. The email simply said : “I would like to order x cards; how do I transfer the money?” Soon more mails with the same intentions arrived. However, we also did some physical begging work. One day we took the car and drove around the area to flog off cards to friends who live around here. From this place I would like to thank all contributors. The prizes will be released on 29 January, and I will certainly report who has (or has not) won. This is a bit of a strange blog, mostly because I feel I have no other means to achieve my goal. In order to get this goal across a short introduction first. 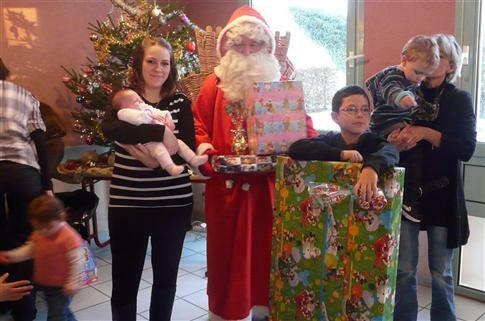 The “Amicale de Cormatin”, a small group of volunteers, assures that each year the seniors of Cormatin are invited to a dinner party, and that for the schoolchildren of Cormatin a Christmas party with a nice present for each child is organised. To fund these events, the Amicale organises yearly a number of events, of which the proceeds are used for these good works. One of these events is the yearly bingo, and part of this bingo is yet another fundraiser, in which we somehow got involved. The evening before the public bingo or Loto, there is another bingo evening (with attractive prizes), this time played with cards sold to friends and family of the members of the Amicale. All villagers are playing that evening with the cards sold on behalf of those who bought the cards. Only afterwards it is announced who has won the prizes. Last year we had to flog off 20 cards à € 2.00, but this year someone has decided that we should be in for double the amount. We do not have that many acquaintances around here, through circumstances we received the cards later than the other Amicale members (hence all local friends have already been provided) and that is where the ex-home front might come in. If those who are interested in helping the Amicale to help send us an email, and we will in our turn provide the potential benefactor with the relevant (Barclay) bank details. At the current exchange rate the cards should be approx. ₤ 1.70 per card. We will transfer the money to the Amicale, taking care of possible transfer costs, as well as safeguard the prizes in case you win something. The prizes are : a TV with LCD screen, a wireless Hoover and an espresso machine. 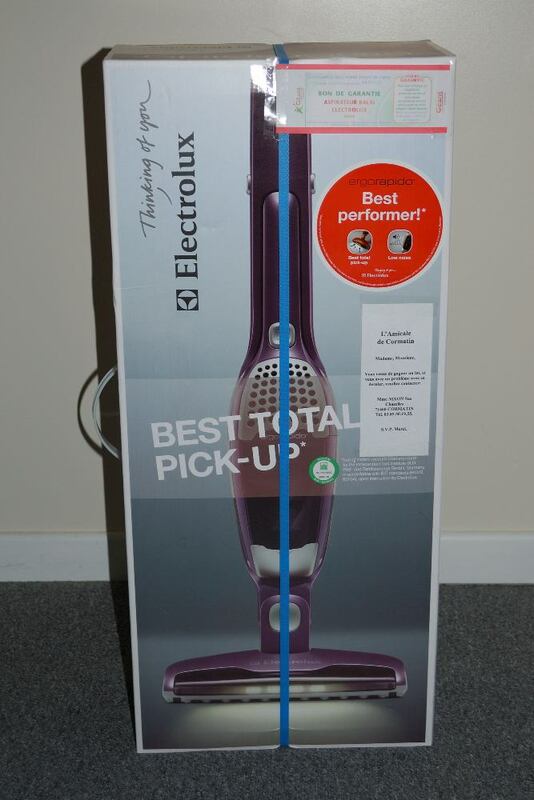 We will keep hold of the prices until the winners collect them, or until we can deliver them. Please, don’t let us down! Burns’s words sprang to mind when I received a “Merry Christmas and Happy New Year” card via e-mail. The sender was a woman, who stayed on our campsite early July this year. Earlier that year Fifi had given birth to 4 kittens, was sterilised (a bit too late!) and had an accident with most likely a car on our track. Fortunately, the kittens were ready to go when the accident happened, so Fifi could rest in piece, as far as a young cat contained in a 1 x 1 m cage can rest in peace in order to recuperate. 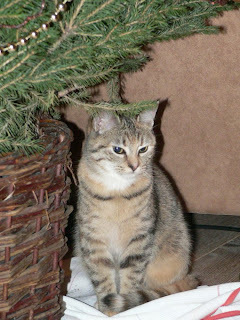 But until then we had kept the kittens in Fifi’s apartment, a cave under the staircase to our front door. The kittens were still sleeping most of the day, but when awake they caused total havoc in the apartment. Fortunately the weather was fine, we spent a lot of time sitting in the garden near the campsite, and to give them some freedom they could wonder around our table, drink and sleep at our feet. Some campers were very keen on stopping by our table, not necessarily for a chat with us, but to play with the kittens. Of course the situation became a bit more pressing when Fifi was no longer capable of feeding them. 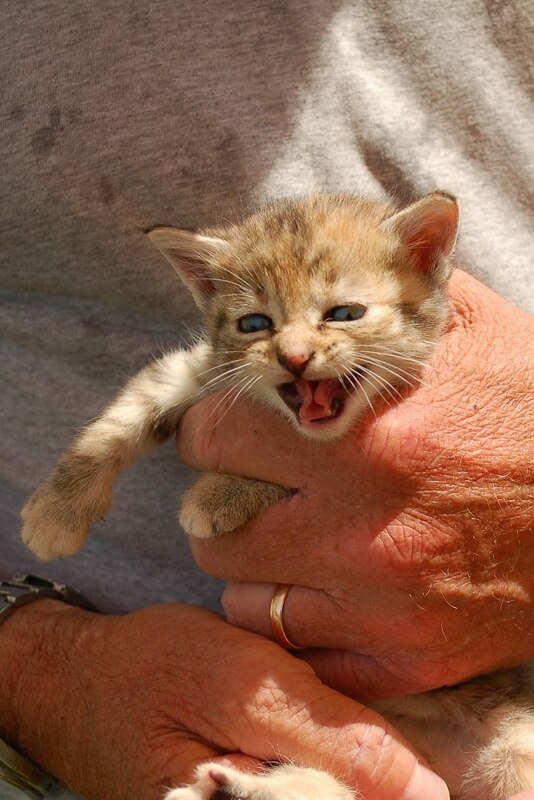 We had placed adverts at the local baker, newspaper saleswoman, butcher, etc., and verbally advertised the kittens to our campers. We (almost) live along the old local railway between Chalon-sur-Saône and Mâcon (nowadays a cycle and walking track, the Voie Verte). The heavy duty railroad between those two towns is still in use, and follows more or less the Saône. Further, luckily outside earshot, there is the TGV line between Le Creusot and Mâcon. Whenever one wants to hear the sound of trains, one has to travel. One of the tourist attraction around here is the Parc des Combes in Le Creusot. Le Creusot is a former industrial town, in its heyday heavily involved in coal and steel industries. The Parc is mainly aimed at children, but it also hosts steam events every so often. 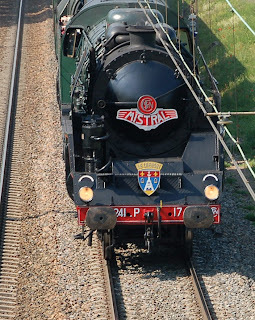 Besides it offers home to one of the fastest steam locomotives ever built, the 241P17 . One can see the Mistral regularly in the neighbourhood, because quite a number of the train’s trips are coming past or through Chalon, Chagny, Tournus and Mâcon. In Chalon, Tournus and Mâcon there is normally a long stop to enable the Anoraks to shoot their films, photos or sound bites. The picture with this Blog was taken while the train came towards a viaduct near Chagny with a speed of approx. 100 km/h. What is more thrilling than seeing this piece of technical ingenuity ploughing through the beautiful Burgundian landscape? I was born and brought up in Delft, The Netherlands. Marriage and work brought me from place to place in the Netherlands: Maassluis, Zoetermeer, Amsterdam, Rotterdam. In 1982 I moved for work temporarily to Singapore for 6 months. Those 6 months turned out to be 3 years in the end. I still consider Singapore one of the best places I have lived and worked. I really enjoyed working there, and I still have many Singaporean friends. After having worked many years for design offices specialised in the petrochemical industry as a civil engineer, I decided it was time for a change. And the change had to be something dramatic, not just swapping civil for e.g. structural engineering! A number of things helped tremendously; bankruptcy of the company I had worked for for over 30 years, being employed by a compatitor which, at least that was what it seemed, was heading the same way, and last but not least a partner who was also fed up with her employer. And that was the start of a couple of years holidaying in France trying to find the place we would like to settle down in, a few weeks of intensive house hunting, and finally the move from the Netherlands to France.